It's the 1920s and I'm waiting for a train, which will stop at the station at 3rd Street and Jackson in Phoenix, Arizona. Luckily, I'm staying at the Hardwick Hotel, which is just a few feet away, so I can relax there, and when the train comes, I'll wander over there. I already have my ticket. 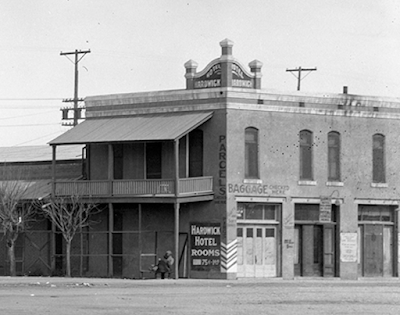 Relaxing at the Hardwick Hotel in the 1920s, 3rd Street just north of Jackson, Phoenix, Arizona. The Hardwick Hotel, at right, in the 1920s, 3rd Street just north of Jackson, Phoenix, Arizona. 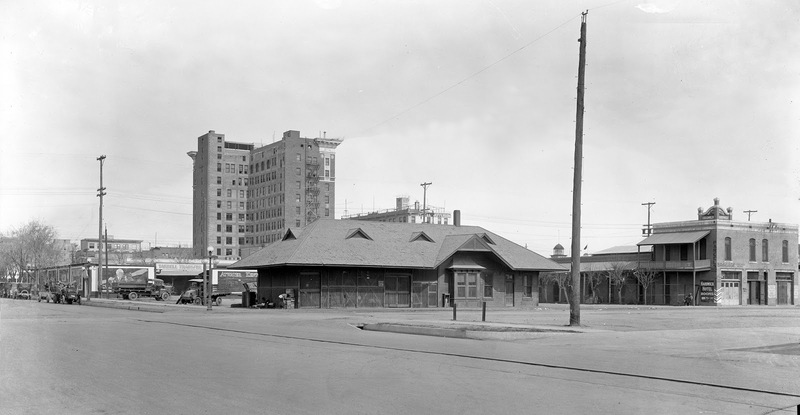 In the background to the left, behind the train station, is the Jefferson Hotel, at Central and Jefferson. 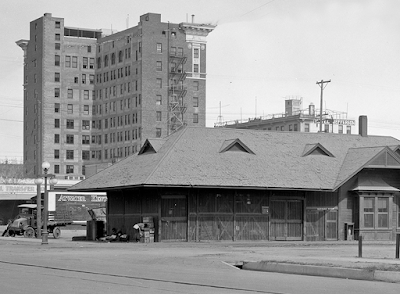 The tower of the territorial city hall is visible in the center of the photo, which was on Washington and 1st Street. It's an overcast day in Phoenix, which is unusual, so it's pretty comfortable. The Hardwick doesn't have air conditioning, but it has those nice sleeping porches, so I had good night's rest last night. I wonder if the people over there at the Jefferson Hotel are more comfortable than me? I know they spent a lot more. Wow, look at that gigantic building over there. I understand that the young George Luhrs built that, along with his dad, H.N. They must be rich! Looks like Phoenix is really growing up! I'll bet there's a great view of the Phoenix Mountains from up there. Maybe the next time I'm in town I'll go up to the top, ride in one of those new-fangled elevators. Never been in an elevator before. I understand that the operators are very careful, but it would still make me nervous! It's a beautiful building, I hope that the city of Phoenix is wise enough to never tear it down. Here comes my train, I'd better get going. The train station and the Hardwick Hotel are long gone, but the Luhrs Building, which is on Jefferson and Central, is still there, as is the building that was originally the Jefferson Hotel, nowadays called the Barrister Building. As of this writing, the Luhr's Building is where the Bitter and Twisted Cocktail Bar is.